Today: A tasting of Bloody Mary garnishes with Hugh Acheson left us satisfied, with a better understanding of how much to fuss over this unfussy beverage. Bloody Marys are probably my favorite cocktail because they have all the components of my favorite foods: sodium (check), spicy in no less than three ways (pepper, horseradish, hot sauce) and sometimes more, made of tomatoes, and—lest we miss the whole point here—usually garnished with pickles. Rather than being repelled by its thick and vegetal ways, I am enamored; here is the only drink I know of that's laced with fishy, funky Worchestershire sauce and comes with a teetering built-in snack. I myself don't necessarily prefer a Bloody Mary as a hangover cure—one of my favorite ways to imbibe is simply by ordering a can of Mr. & Mrs. T's Bloody Mary Mix on a plane and having it on the rocks without any booze so the tart, tangy juice melts down to something gentler. But the fact of the matter is that the Bloody Mary, cockeyed from a slap of vodka just as you might have been the night before ordering one, is above all else the king of brunch. In celebration of this excellent cocktail, we invited Hugh Acheson, a known pickle aficionado, to participate in a tournament of garnishes. 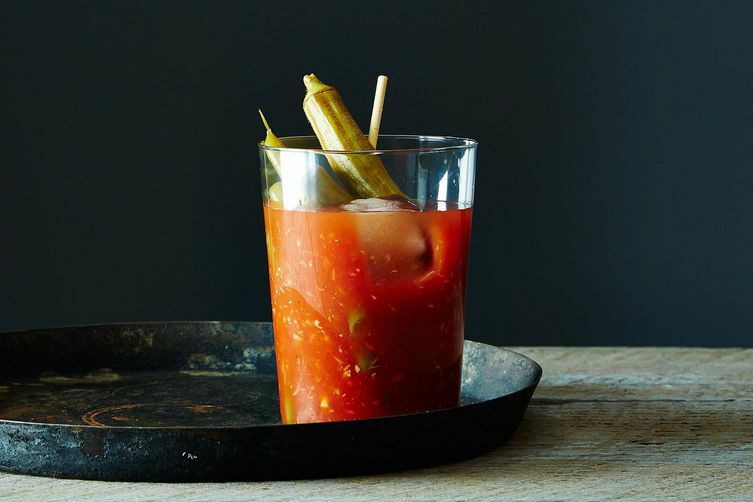 The Bloody Mary recipe in his first cookbook (his next just came out!) is accompanied by a trio of pickes—okra, jalapeño, and dill—so we thought he'd have an opinion or two on the matter. What might have been good to know is that Hugh, being himself in the restuarant business, doesn't often go out for brunch, so he normally doesn't drink Bloody Marys—he will, however, sip politely from the glass if you hand him one, and he'll definitely try your selection of pickles. We gathered around a few platters of toppings ranging from the decidedly shi shi (halves of Rick's Picks smoked okra) to the obvious (celery) and the dubious (hard-boiled eggs, quartered), dunking, nibbling, and spearing some with toothpicks in a balancing act on our glasses' rims. More: Pick up a jar of Rick's Picks smokra. There was a bracket and an announcement that we would now "begin" this civilized taste test, a jousting tournament of pickles. Glasses clinked merrily. 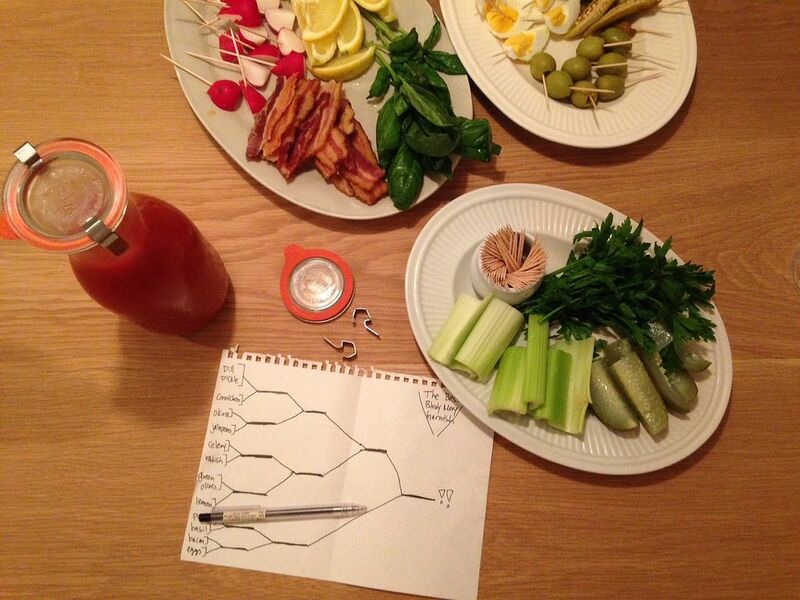 But questions quickly surfaced: How many Bloody Mary garnishes are too many? What's essential? What's ridiculous? What's the ideal combination? As you might expect, opinions ran the gamut: Hugh deemed an acidic element "probably" a good idea—a lemon or lime at the very least. Pickled anything seemed to appease the lot of us, while bacon brought division. Hugh suggested that a pickled shrimp might be nice, and we regretted not having whipped up a batch before his arrival. Garnish contenders included dill pickle spears, cornichons, pickled okra, pickled jalepeño, celery, radishes, green olives, lemon slices, parsley, basil, bacon, and hard-boiled eggs. Rachel offered a heartened defense of a small slider as a garnish, we passed around a picture of a whole fried chicken atop a Bloody Mary glass, and any semblance of the tournament's structure began to crumble (I'd, um, finished my cocktail by then). Kenzi put a whole tree of basil in her drink and sipped between its leaves. Hugh's hard-boiled egg plopped into his glass, the chalky yolk flaking off to murky its waters. Someone (ME) scribbled over the tournament bracket, declaring it simply the wrong goal to try for. Technically speaking, there are indeed some garnishes that make more sense than others for a Bloody Mary, but overthininking them is not the answer—a rogue egg, for instance, turned out to be delicious chased with a few sips (this is a breakfast drink, after all). 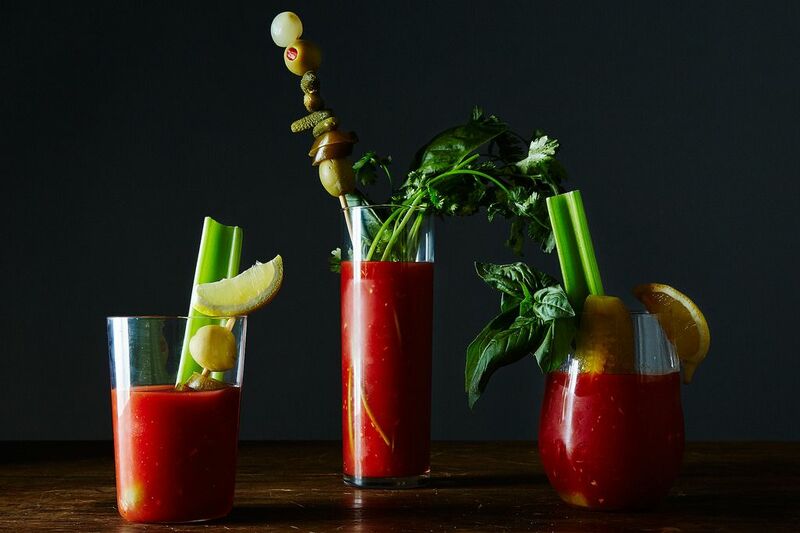 The beauty of the Bloody is that it doesn't apologize for being itself, whether crammed with a whole bamboo skewer of garnish delights or dunked with a lonely stalk of celery. It's sometimes abrupt—but that's to shake your useless, hungover body into a working set of tools again—and comfortable in its adaptable nature. The key is to quit thinking about it: Just tilt back the glass, munch on your stirring stick, and (hopefully) feel better again. As for the garnishes? Whatever you're hungry for. Garnishes, including dill pickles, pickled okra, cornichon, celery, lemon, parsley, radish, bacon, or hard-boiled egg—or none of the above, or others. How do your garnish your Bloody Mary (or do you like them at all)? If you can find Zing Zang bloody mary mix, you will NEVER use another mix. It is delicious! Served with celery sticks, green olives, and pickled okra, it's the best! I love bloody marys! One of my favorite cocktails for sure. I love them most with shrimp as a garnish! You would be surprised at the bars I have ordered a bloody mary from that do not have celery. I can't stand to have one without lots of celery. Oh, yes, the green olives sure help and perhaps asparagus.